Tana French surpasses herself with character nuance and plot twists in her sixth gritty, Dublin-set murder-mystery. 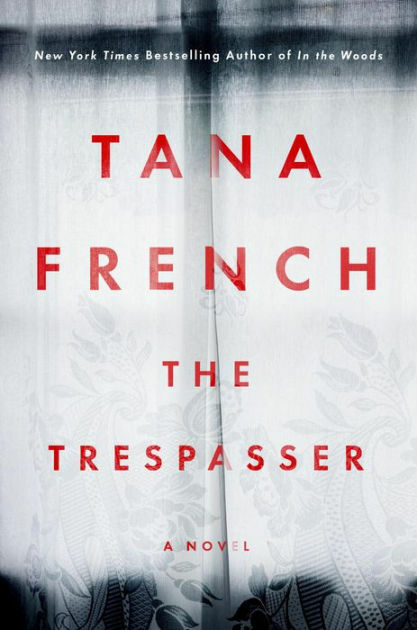 Tana French’s sixth novel, The Trespasser, revisits the burgeoning careers of Dublin Murder Squad Detectives Antoinette Conway and Stephen Moran, introduced in The Secret Place. As atmospheric and intricate as French’s past work, this engrossing mystery succeeds in both style and plot. Fans and new readers alike will be captivated. Conway and Moran are partners now, but they are far from fitting in with the rest of the Murder Squad. The guys–and they are all guys–give Conway more than the usual rookie hazing. In the opening pages, she and Moran are assigned what looks like yet another boring domestic homicide: a beautiful young woman has been killed, apparently in a fit of passion during a romantic dinner at home. A little too perfect, she “looks like Dead Barbie,” and her apartment “like it was bought through some Decorate Your Home app.” But most disturbingly, Conway is sure she’s seen the vic somewhere before. The young detectives may be a little overeager to find links to organized crime or something more involved, but as this case unfolds, the ambitious Moran and much-beleaguered Conway find wider-reaching connections than they’d bargained for. As an added headache, the obnoxious veteran Detective Breslin has been assigned to “assist” Conway, who is ostensibly the lead detective, though Breslin seems to think he can call the shots. French’s fans will recognize of the hallmarks of her mystery novels: intense interior struggles afflicting the protagonist detective; a potent undercurrent of class tensions; a case that appears to have a mind of its own; a victim whose personality haunts those who are seeking justice. The oppressive mood of the Murder Squad threatens to overwhelm Conway, who’s barely holding it together under the stress of workplace harassment; the incident room she is assigned becomes a character unto itself. The Trespasser is told in Conway’s voice, giving the reader full access to her troubles and offering perhaps a hint of the unreliable narrator to sneak in. It is a testament to French’s talent that she more than matches her established achievements in characterization, dialogue, atmosphere and detailed setting, while also surprising her reader at every turn. She offers layers of possible betrayal, hypothetical events and convoluted stories, even an upheaval in Conway’s private life that echoes an element of the case at hand. More than 400 pages pass by almost without blinking, as The Trespasser‘s momentum presses forward to a finish that staggers Conway and Moran as much as it does the reader. This is a complex, compulsively readable novel; French keeps getting better and better. This review originally ran in the August 29, 2016 issue of Shelf Awareness for the Book Trade. To subscribe, click here. Rating: 8 stories we tell ourselves.